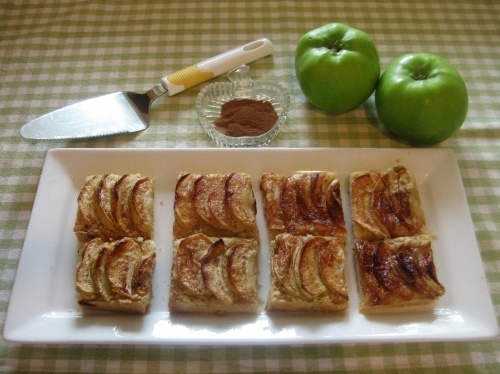 Let’s hope we have a good apple harvest this autumn, giving us the chance to cook some lovely recipes. My recipe is one of my favorites which I have been making for many years. These little cakes can also be served warm with cream. You will need a shallow square tin 20cm/8in. Line the base of the tin with greased greaseproof paper or baking parchment. Rub the butter into the flour, stir in the sugar. Press the crumbly mixture firmly into the tin. Peel the apples and cut into quarters. Remove the cores and cut into thin slices. Arrange the slices in rows over the mixtures overlapping slightly. Mix the sugar and cinnamon and sprinkle evenly over the apples. Melt the butter and drizzle over the top. Bake for 15 minutes then reduce the heat to Gas 5/190C and bake for a further 20mins or until the base appears firm and begins to shrink slightly from the sides of the tin. Cut into squares and serve either hot or cold. NOTE: Butter does give the best flavour.